Well, in Russian it doesn’t refer to a salad dressing. Ask a Russian person for some винегрет and he’ll hand you a salad made of beets, pickles, potatoes, carrots, and onions. The word vinaigrette in English and the word винегрет in Russian are false cognates. They do sound the same, but they represent different things. So, listen to and repeat these four words. Three are cognates, but one is a false cognate. Ready? So, the Russian word магазин translates as store in English. Ok, quiz time. Of those four locations, where might you go to have lunch? Where might you go to play frisbee? Where would you go to buy something? And where would you go to be in the heart of the city? As we let those percolate in your memory, let’s now review the material from the last podcast. Say: I like Kiev but I love Odessa. Мне нравится Киев но я люблю Одессу. Do you like St. Petersburg? What are two ways we might say: I love you. So, do you remember our four new words? Where would you go to fly a kite? Where would you go to look at the city’s tallest buildings? Where would you go to buy a souvenir? Where would you go to have coffee and snacks? …and then you gesture for them to all follow you outside. And that’s how poshli is used. It’s a call to action, to get people to head off to some location. James and Natasha went to the park. Джэймс и Наташа пошли в парк. How would you translate that whole conversation? You say: Katya, let’s go! And you say, To the center. Of course, usually it’s the person who is local who’d be the more pro-active person. So, imagine your Russian friend is ready to head out. What will she say? To where? as in, Where are we headed? Thank you, Brent, for your kind words. It’s kinda the coolest part of the job, to hear that it’s working for people. But I’d like to talk for a moment about your request to learn colors. The problem is, an all-audio format isn’t really the ideal way to teach a language, and the topic of colors is a classic example of why. In the field of language learning — among both students, and those who create courses — there seems to be an assumption that, well, language is something we speak and something we hear, so an audio-only course should be a great way to learn. Assuming you’re not blind, then your vision played a major role in your acquisition of language. I don’t mean for reading. I mean, for learning the meaning of words and phrases. Honestly, all five senses play a role in learning a language, but since we are primarily visual creatures — that is, most of what we know about the world is processed through our vision — that means most of what you learned in English was done visually. Whereas, in a course that uses video, I can say: “You’re about to see a series of colors onscreen. Please say each one in Russian.” So I can just show you a color and you name it. With video, I can make you think directly in Russian. That limitation of an all-audio format is why there are a lot of topics and themes I’m avoiding in this podcast. 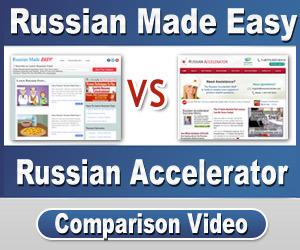 And it’s why I always encourage you to check out our Russian Accelerator course, because it features video. 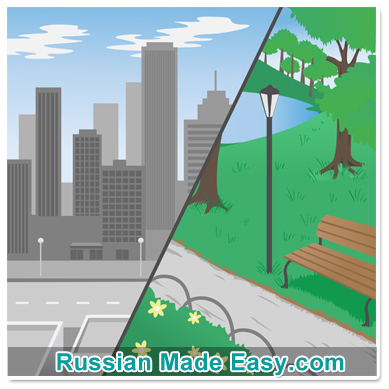 Long term, if you really want to become conversational in Russian, a video-based course is the way to go. Alright, let’s get back to today’s new words. Imagine your Russian friend wants to buy a new phone and is ready to head out. What will he say to you as he opens his front door to leave? How will he say: To the store. Tell him: Ok. Let’s go! And I want a cappuccino. Suggest: Let’s go to Starbucks? Ok. I love Starbucks. Let’s go! Хорошо. Я люблю Старбакс. Пошли! That’s the end of today’s podcast. And given that we just learned to talk about where we’re headed, next time we’ll learn to talk about where we are. So, be sure you have today’s new words and constructions on your flashcards, and I’ll see you in the next podcast. You translated “And I want a cappuccino.” as “И я хочу капучино.” Why did you use “И” instead of A? We would use ‘A’ as a contrast. And if the word is unfamiliar to you, there’s no way to know. where virtually any letter has many (and often bizzare) pronunciations. or “kin-saw” (as in, Arkansas).